Mr. Leslie A. Caldon, Jr., 69, of Belmont died in Colchester, VT on April 11, 2019. He was born in Franklin on May 25, 1949 the son of Leslie and Loretta (Nadeau) Caldon, Sr. Leslie was raised in Franklin and attended local schools. He was a Belmont resident for over 30 years. He served more than 20 years in the US Army for and retired as a Sergeant First Class (E7). He later worked at the Manchester and Plymouth Post Offices. Leslie was a member of Franklin VFW Post 1698 and Northfield American Legion Post #49 in. 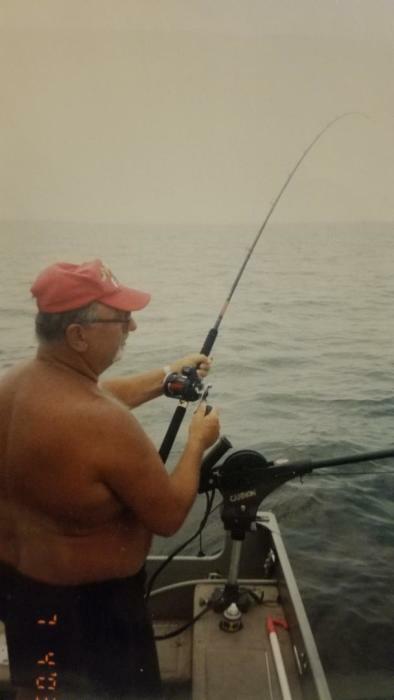 He enjoyed the Red Sox and Bruins but his passion was family and fishing with friends. He has been known as “Junior,” “Dad,” “Sarge,” “Pepe,” “Pac-Man,” and even “Fish” but he was known by everyone as the man with the biggest heart. Family members include his wife, Judith (Gray) Caldon of Belmont, 2 children: Deanna Benner and husband Michael of Medford, NJ, and Timothy Caldon and wife Diane of Loudon, 10 grandchildren, 1 great grandchild, 3 sisters, Norma Barney of Bristol, Lillian Rollins of Salisbury, and Linda Norris of Concord, a brother, Arnold Caldon of Mumford, TN, and nieces and nephews. Visiting hours will be held at Thibault-Neun Funeral Home, 143 Franklin St., Franklin on Tuesday, April 16, 2019 from 5:00 to 7:00 pm. A service will be held on Wednesday, April 17, 2019 at 12 noon in the NH Veterans Cemetery Chapel in Boscawen. A celebration of his life will be held at the Franklin VFW following the services.